Protein is an important component of the diet and getting the right amount of protein can help to improve health in a number of ways, including promoting weight loss, helping decrease muscle mass loss and helping to improve blood pressure. This suggests that protein benefits really are substantial. Yet, despite this, protein is a heavily debated topic, and there is a lot of misleading information out there. One of the most common claims is the idea that too much protein is bad for your health. It’s true that excessive amounts of anything is going to harm your health, but protein itself doesn’t pose much of a threat. In fact, most claims about the dangers of too much protein focus on a few key points. These include, the potential of protein to contribute to weight gain (actually, protein helps in weight loss), protein’s ability to dehydrate (so, drink more water) and the potential to cause kidney problems (that’s only true for people with kidney disease) (1,2,3). Additionally, sites often focus on the recommended daily intakes of protein as indications that you should be limiting protein intake. Yet, those recommendations aren’t fully accurate (4). In many cases, you will find sites simply repeating the same information or referencing one another, without providing any actual evidence about their arguments. There is actually no significant evidence that too much protein can cause harm for most of the population. Additionally, as I will illustrate, increasing your protein intake can offer significant health benefits. Loss of muscle can be a major issue, and this is something that happens over time, especially as people age – in the form of age-related muscle loss. Additionally, if you are actively trying to lose weight, you will find yourself losing muscle along with fat, which is far from ideal. To maintain a healthy body composition you need to hold onto your muscle. In fact, people who are thin but also have little muscle fall into a group called the ‘normal weight obese’ or ‘skinny fat’. This group is actually at risk of detrimental health conditions (5,6). One of the benefits of protein falls into this area because consuming enough quality protein is absolutely critical to ensure you avoid the loss of muscle mass (7). Exactly how much protein you need will depend on a range of factors, including your age and your activity level. Because of this, common recommendations for protein intake are often not adequate (8,9,10). In particular, this means that older adults (11), athletes (12) and people who are physically active tend to need considerably more protein to make sure that they do not lose muscle mass. Protein helps to prevent muscle loss because it plays a critical role in building muscles overall (13). This also means that if you are trying to gain muscle, you need to be taking in enough protein to meet this goal. That requirement is why many bodybuilders use protein powder and protein shakes to increase muscle development. However, gaining muscle isn’t just relevant for body builders. Instead, anyone trying to lose weight should also be focusing on building muscle, to help protect their health and avoid the paradox of normal weight obesity (14,15). For example, one study found that resistance training along with a balanced energy restricted diet (where protein made up 25% of calories) was able to promote weight loss and muscle development in overweight/obese older adults (16). In the elderly, sufficient protein intake is critical for promoting myofibrillar protein synthesis, a key process in muscle development and the amount of protein needed is higher than for younger individuals (17,18). Whey protein has been found to be a particularly effective protein type to promote this muscle development (19) and is associated with other benefits of protein as well. In regards to muscle development, the benefits from protein are strongly associated with the presence of branched chain amino acids. The most significant branched chain amino acids for humans are leucine, valine and isoleucine. These all play a role in activating protein synthesis and helping to promote muscle growth overall (20). People often claim that a side effect of eating too much protein is weight gain. That idea is completely flawed. It’s based on the way that high protein foods (like red meat) tend to be higher in fat and in calories compared to low protein foods. 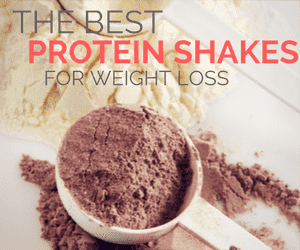 That isn’t even always the case, because of products like protein powder, which tend to be relatively low in calories. Besides that, if you increase the protein content in your diet without paying attention to calories and how much you eat – yes, you probably would gain weight. But, it is very possible to increase your protein intake while keeping your calories roughly the same. For example, one study found that increasing protein intake from 15% to 30% of the diet promoted consistent long-term weight loss (21). An image of the study’s outcomes is below. The first 15 days of the study were at a 15% protein diet, they then went to a 30% protein diet. Those are the red and blue parts of the graph, respectively. You can see that there wasn’t a whole lot of change in weight at that point. The green part of the graph is where it gets interesting. Prior to that point, participants were on a calorie controlled diet, but during the green part, they were able to control how much or how little they ate (while maintaining the same ratio of nutrients in the diet). As you can see, at a 30% protein diet, participants inherently ate less and experienced significant and consistent weight loss. Overall, a high protein diet tends to involve less energy intake overall, as protein is more satisfying than many other nutritional components of a meal (22). This outcome makes weight loss easier, especially for people who struggle to stick to a diet. Higher protein in the diet has also been associated with improved body composition overall (23,24). This suggests significant advantages for weight loss and also for health in general. In fact, because protein makes people feel fuller, they tend to eat less without even intending too. Plus, it is much easier to stick to a diet when you aren’t feeling hungry all the time. As protein benefits go, anything that helps contribute to weight loss is certainly a good thing. Many of us gain a lot of weight around our stomachs, but this also seems to be the last place that we lose the weight. Research suggests that eating a high protein diet can not only help you with weight loss but also help people to lose weight in this specific area. For example, one study found that across five years, intake of protein was inversely related to waist circumference. This means that the people who ate more protein tended to lose more inches off their waist (25). Another study found that quality protein intake was associated with decreased levels of abdominal fat (26). I mentioned before that protein is good for weight loss, and much of this comes from its ability to suppress appetite (27,28). For example, if you eat a meal that is high in protein you are likely to feel full for longer (29). Likewise, you may end up eating significantly less at your next meal (30). In fact, research has consistently shown that it is possible to lose weight simply by adding protein to the diet, without intentionally restricting the amount of calories that you take in (31,32). You can actually end up decreasing your own calorie intake simply because you don’t feel as hungry. A classic example of this is the use of eggs for breakfast. People often steer away from eggs because of their high cholesterol content (even though they are actually extremely healthy). However, eggs are also high in protein and they can provide a much more filling approach to breakfast. Studies have found that having eggs for breakfast may help to promote weight loss, especially for people on energy deficient diets (33). There are two key things that may play a role in this effect. One is ghrelin, which is a hormone that plays a role in the way that energy is distributed and the rate that it is used at. The hormone also plays a key role in hunger and its secretion can trigger hunger. As such, lower levels of ghrelin are an indicator of filling food. One study illustrated that a high protein breakfast resulted in a significantly lower concentration of ghrelin following the meal than a low protein one, further showing how high protein meals can be more filling (34). A second hormone is peptide YY, which has also been associated with appetite. In particular, while ghrelin is thought to play a key role in hunger, peptide YY has been associated with feeling full. One study found that a high-protein meal increased peptide YY and decreased ghrelin for children in comparison to a high carbohydrate meal and a high fat meal (35). This suggests that both peptide YY and ghrelin are very relevant in relation to the benefits of protein. So, in general, if you eat more protein you are likely to feel less hungry and will probably eat less as a result. Sounds like a win-win to me and yet another example of protein benefits. You can also help this along further by paying close attention to how full you are. More information about doing so can be found over at The Gist of Fit and this is a powerful approach for weight loss. Athletes and bodybuilders use protein frequently, especially in the form of protein shakes (36). One key reason is protein’s ability to promote muscle building, but another reason is the way that protein can help muscles to recover. This is particularly relevant to anyone who is active, regardless of whether or not they consider themselves athletes. Many studies have shown that protein supplementation may play a role in muscles following a workout, helping in the recovery of performance and of muscle function (37). However, more research in this area is needed, as current study designs have been limited and this limits the available evidence (38). Another one of the benefits of protein comes from improvements in muscle performance. While research on this area hasn’t been extensive, the potential for protein to act in this way does highlight the multiple benefits of protein, especially in relation to developing and maintaining muscles. One study looked at outcomes of 17 different studies into dietary protein and muscles. The authors found that the studies illustrated that increased intake of protein contributed to improved muscle strength during training (39). Another review indicated that supplementation with protein could act to increase muscle performance as well as muscle mass, as long as the training stimulus was sufficient (40). Some theories also suggest that high protein diets may increase energy expenditure, which is another potential way of contributing to weight loss. One study on the topic found that high protein diets had significantly increased rates of glycogenesis, which in turn results in a higher amount of energy being burned (41). Another study indicated that high protein diets can significantly increase the level of thermogenesis, increasing energy used (42). The difference in energy burned between high protein and a low protein diet is significant, even though it is relatively small – around 80 to 100 calories per day (43). However, for people trying to lose weight, this can be a very relevant difference. The thermic effect of high protein foods is also thought to play a role in why high protein foods are more filling than other types of foods (44). One of the hardest things about weight loss (for most of us anyway), is trying not to eat foods that we really want to eat. Food cravings typically center on unhealthy food, like chocolate, ice cream or pizza, which makes them all the worse. Often, they can be incredibly powerful, making us eat the very food that we planned not to eat. Protein can play a role in reducing the cravings that surround food and the way that people obsess over food. One study on the topic compared a high protein and a normal protein diet in overweight/obese men. The authors found that participants on the high protein diet were fuller throughout the day and were less likely to want food late at night (47), as can be seen in the image below. That pattern is particularly relevant, because late night eating is a key contributor to weight gain, and obsessive thoughts of food certainly don’t help. Cravings also tend to feed on themselves, as deciding not to have a specific type of food can often make a person want that food more. Another study found that a high-protein breakfast decreased between-meal food cravings (48). If you can break away from obsessing over food and wanting to eat when you aren’t hungry, it makes the process of weight loss a whole lot easier – and eating more protein is a key approach towards achieving this (49). I’ve found this impact myself too. High protein meals and snacks make it so much easier to avoid the things I shouldn’t be eating. In fact, this is probably one of the protein benefits that I like the most. Historically, the vegetarian diet has been associated with low blood pressure, which can lead to the assumption that protein contributes to high blood pressure. In reality, that observed blood pressure is likely to be the result of lifestyle factors, and protein can actually play a key role in decreasing blood pressure (50). Indeed, diets that are higher in protein have actually been associated with a lower risk of high blood pressure (51). One meta-analysis looked at this, including data from 40 clinical trials, which had around 3,000 participants collectively. The authors found an inverse relationship between increased protein intake and blood pressure (52). A second study found a similar outcome using a randomized crossover trial that had 352 participants. The participants in the study either had prehypertension or early stage hypertension (53). The authors of that study also argued that replacing some carbohydrate in the diet with either milk or soy protein could be an effective way of reducing the risk of hypertension and also treating the condition (54). A randomized controlled trial also found that soybean protein had similar effects on blood pressure, both for people with and those without hypertension (55). Another meta-analysis also found a similar outcome, suggesting that protein could have a beneficial impact on blood pressure, even though the impact was likely to be relatively small (56). Some arguments suggest that high protein intake can contribute to osteoporosis development although the amount of evidence for this perspective is limited (57). On the other hand, there is significant evidence linking insufficient nutritional intakes, including insufficient intake of protein, with a greater risk of fractures related to osteoporosis. Likewise, if a relationship between high protein and osteoporosis existed, this should be consistently evident in observational studies, but that has not been true (58). A recent review also highlighted on this topic, arguing that there is not sufficient evidence to suggest that limiting protein intake can help to protect the bones. Indeed, limiting protein may result in individuals having inadequate protein, which may potentially be dangerous (59). In fact, one study found that people with the lowest protein intake also experienced the greatest level of bone loss (60). The importance of protein for bone health suggests that people with low protein intakes may need to increase their level of protein to protect their bones. Interestingly, research also suggests that both proteins from animals and those from plants play a similar role in relation to bones. Likewise, neither type of protein has the potential to increase fracture risk (61). The role of protein on bone health is particularly important as people age, as their risk for fractures and osteoporosis increases (62). So, as people age it is particularly important that they emphasize getting enough protein in their diet. Recommendations for protein consumption vary, but a common approach is for around 15% of your daily calories to come from protein. Most people already hit this amount, which can make them think that they don’t need any more protein (63). In fact, the average protein intake in the United States as a whole is 15.2% (64). However, that recommendation isn’t fully accurate. For one thing, that level of protein is based on the aim of not losing muscle and doesn’t take protein benefits into account at all. Additionally, the current recommendations aren’t even enough to prevent muscle loss in some groups, including older adults (65). Likewise, current recommendations may be significantly too low for athletes and active individuals, potentially contributing to muscle loss (66,67). For reducing blood pressure, current recommendations promote protein intake of around 18%, which is significantly higher than many people consume (68). One of the hardest things about losing weight isn’t the weight loss itself, but actually keeping the weight off. This issue is one reason why people often end up bouncing between diets and can easily gain back all of the weight they have lost. Protein can actually play a key role in maintaining weight loss, in many of the same ways that it helps to promote weight loss. Perhaps one of the biggest reasons is that by being filling, protein makes it easier to stick to a stable eating plan, making any weight loss maintenance more effective in the long-term. One study found that increasing protein intake to 18% of calories resulted in a 50% lower amount of weight that was regained (69). People often steer away from protein because it seems difficult to add to the diet. However, it doesn’t have to be. There are a large number of protein-rich foods that can be easily added into the diet. Which ones you choose will depend on a range of factors, such as the foods you like, any allergies and your own specific diet. One of the most important things to remember is to take the calories into account because some protein-rich foods are relatively high in calories (although this isn’t true for all of them). Additionally, you can also supplement with protein or use protein powders (like whey protein) as part of healthy, high protein smoothies. In fact, one study indicated that supplementing with protein was more effective than allowing people to include it in their diet themselves (70). This isn’t too surprising because it is a lot easier to simply take a supplement than to try and incorporate high protein food into the diet most days. Nevertheless, you can turn to sites like Eat This, Not That for information about simple ways to increase protein intake.